Earlier today in China, the honor V8 was officially introduced. While most of the specs were already revealed when the handset was certified by TENAA, it won't hurt us to run through them again. The honor V8 features a 5.7-inch display with a 1440 x 2560 QHD resolution. Under the hood is a home grown Kirin 950 SoC with an octa-core CPU. 4GB of LPDDR4 RAM with 32GB or 64GB of native storage is inside, and a 128GB capacity microSD can be accessed for those seeking additional memory. There is a dual camera setup on the back, featuring two 12MP cameras with one designed to take 360 degree images. 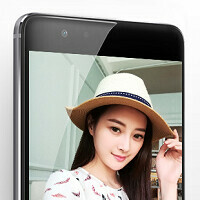 An 8MP front-facing camera can be used to shoot selfies and to take part in video chats. Also on the back of the phone is a fingerprint scanner, and the 3500mAh battery will quickly charge thanks to support for 9V2A. A super-saving mode will allow you to squeeze extra time from your juicer when you are running on fumes. Besides a Type-C port, NFC is also on board allowing the V8 to work with Huawei Pay. Android 6.0 is pre-installed along with EMUI 4.1 running on top. The model with 32GB of storage is priced at the equivalent of $384 USD, while the 64GB version will cost $430 USD. The phone can be ordered from Vmall. Color options include Champagne Gold, Glacier Silver, Rose Gold and Platinum gold light. Yessss!!!!! Now can I order it here in America? USB 3 or still USB 2? I can read 1.76µm (pixel size) ? Phones under huawei brand are sold at higher prices while Honor branding phones are budget priced. They just need to improve on their video recording, stabilization and 4K. EMUI is something that will stay as it is. Anyone know what GPU it will carry? Maybe I missed it. If it has the same mali-t880mp4 from the mate 8 I don't think it will do so well pushing quad. Yep. Should be the same. Would have preferred just FHD meself. I don't think it'll be out of place for one in the honor line. According to some french site there will be 3 HV8 1080p32go/1080p32goNFC/1440p64goNFC !